When Mark Watney was stranded on Mars, he never thought he'd want to return. He encountered a multitude of problems in his 562 solar days - or 687 Earth days - on the planet. From separating hydrogen and oxygen to nearly running out of food, the narrator of Andy Weir's novel"The Martian" had his share of obstacles. He didn't have much say in the matter when he found himself stuck on Mars, and he probably wouldn't want others in the same situation. However, Watney may have found that other people aren't as reluctant to visit the planet as he is. Starting in the 2020s, NASA will send volunteers on a trip to the red planet, which may require some updates and additions to the supply chain. There is a wealth of knowledge to be gained through space exploration. However, Earthlings haven't had the technology to allow them to travel into the depths of space - until now. NASA is in the process of building and testing Orion, the first spacecraft made for human occupancy and long-distance traveling since the Apollo missions. This will open up new doors for astronauts to explore much further than the Moon. In 2021, Orion's crew will set off on its first mission to collect an asteroid and bring it into the Moon's orbit. This will not only provide further insight into these masses, but will also serve as an evaluation for the capabilities of the spacecraft. This will allow NASA's team to test the durability, electrical systems and safety to ensure that a longer journey will go smoothly. NASA hopes to send astronauts to Mars in the next 20 years. At the moment, there are rovers and robots exploring the red planet, gathering information and searching for signs of life. This will help NASA plan for maintaining human life for an extended time on Mars. Unfortunately, an extended stay in space comes with its problems. Other planets do not have the atmosphere that Earth does, whichmay affect the health of astronauts. According to EuroNews, being in zero gravity and having contact with radiation reduces muscle strength and bone calcium. Just one year on the International Space Station can leave astronauts weak. 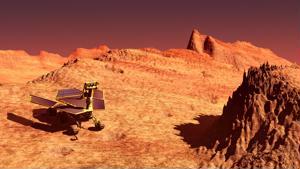 Several years on Mars may be detrimental to their health. NASA will need to work out a plan to ensure these space voyagers can maintain their endurance while on the planet. Space travel is also costly. Building the launcher and the spacecraft is just the start of the bill. NASA also sends equipment and cargo ahead of time to make sure astronauts have what they need while not on Earth. All of these supplies add up to excessive amounts for the agency. However, Ontario-based Thoth Technology may have a way to reduce at least some of the costs. The company has received a patent for a space elevator, which will be used for launching payloads, scientific purposes, intergalactic communication and tourism, Agence France-Presse explained. The tower would allow spacecraft to be launched from the stratosphere instead of the ground, which may reduce costs by approximately 33 percent. This would eliminate drag and require less fuel, both of which add expenses and obstacles in space travel. With blastoff to Mars set for sometime in the 2030s, NASA has time to work out any potential problems. Astronauts will need food, water, oxygen, shelter and a way to communicate to be able to survive on the red planet, and global sourcing will be futile for this mission. The supply chain must be able to account for interplanetary travel so that Mars' colonists don't end up in a Mark Watney situation.